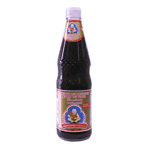 Mushroom Soy Sauce (si-ew hed hohm in Thai),Healthy Boy brand, is naturally brewed from specially selected soybeans and enhanced with the addition of dried Chinese black mushrooms. This vegetarian sauce is superb ingredient in soups, stews and stir-fry dishes. Or try this soya sauce with steamed, boiled or barbecue seafood or meat. Healthy Boy Mushroom Soy Sauce has a delicious smoky, delicate flavor, but as it is highly salty it should be added judiciously. Mushroom Soy Sauce can be used in place of other types of soy sauce in most recipes. As a table condiment, the unusual mushroom flavor complements many type of foods. This Mushroom Soy Sauce is made by the Yan Wal Yun Company, maker of Healthy Boy brand, which has manufactured Asian seasoning sauces for over 50 years in Thailand. Their sauces are made of the best quality natural raw ingredients under hygienic conditions using the most modern processes. Healthy Boy sauces are suitable for seasoning of all types of Oriental foods such as the Thai, Chinese, Japanese and Western food as well. Product of Thailand.